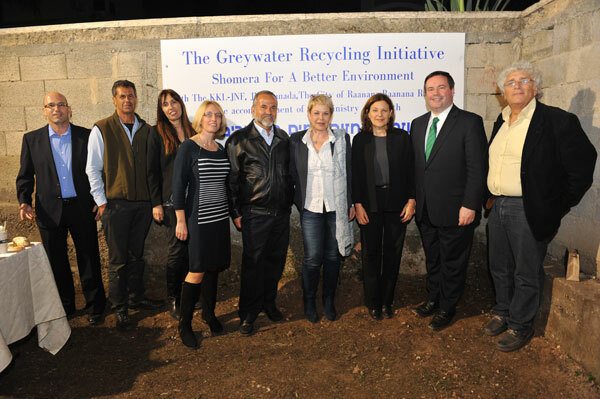 Shomera for a Better Environment’s “Greywater Recycling Initiative” was the selected project of the JNF-KKL London Negev Dinner 2012, held in tribute to the Honourable Jason Kenney, Minister of Citizenship, Immigration and Multiculturalism of Canada. In a film featured at the event,click here. The award was granted for the “Greywater Recycling Initiative”, an innovative, cross-sector collaboration of academia, government, business and third sector, aimed at making greywater recycling a reality in Israel’s urban areas. The award was granted for the “Greywater Recycling Initiative”, an innovative, cross-sector collaboration of academia, government, business and third sector, aimed at making greywater recycling a reality in Israel’s urban areas.”>Your text to link… Miriam Garmaise, Shomera ‘s executive director, Dr. Mike Adel, expert on greywater recycling and Yehuda Olander, manager of the Environmental Quality Unit of the Sharon Region, speak about the importance of integrating greywater recycling systems in Israel. Purpose of the convention: Discussion of the different aspects related to educated use of greywater in various sectors. Shomera participated in the experts’ panel that concluded the convention. A publication of the Water Coalition of the Environmental Movement. The convention focused on the need to consolidate a new outlook on the use of water and the management of the water industry in Israel, with an emphasis on environmental issues. During the convention some major issues that are currently under professional and public debate were raised. Shomera participated in the project panel and introduced its Greywater Recycling Initiative to the public for the first time.